Céline Winter 2013 Bags are here to rekindle my love for the brand. It’s been a while since I find anything interesting, ever since luggage totes begun to flood the market and become a unusually common sight. The exclusivity and innovation that is Céline also lost its lustre. But with the new Fall Winter 2013 collection... thanks to the 'laundry bag' checks as featured on the runway, my bag radar has once again turned its focus back onto Céline. I am a fan of the woven leather ‘laundry bag checks’ bags, but I am just as excited by a new ‘Phantom Luggage’ looking design called the ‘Tie in’. With fold out flaps and a wide shape reminiscent of it’s cousin, the Tie in comes with rolled handles and also feature a fold over top flap (somewhat inspired by Birkin’s but interpreted in a more modern and geometric way). The one in natural tan coloured calfskin is a clear winner for me, with a magnificent colour combination contrasted from the blue lining. Another new bag design worthy of mention is the ‘Fortune Cookie’. As the name suggest, the shoulder bag comes with a folded-in slouch similar to fortune cookies. Fun and unique but at the same time extra appealing when they are offered in amazing colourful madras checks of blues and dusty pinks. This is one bag I would carry in a heartbeat if I was a girl! Also look out for weird pyramid shaped pouches, called the Berlingot, which has a tactile appearance, thanks to materials from fuzzy mink, mohair to wool and even woven leather ‘laundry checks’ (LOVE!). I am not sure how functional they will be, but they are definitely a lot of fun to carry. 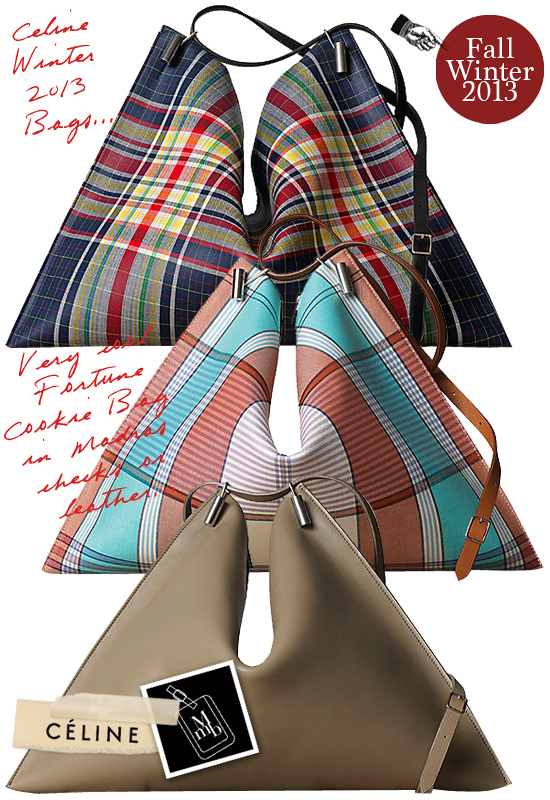 Below: Check out the 'Fortune Cookie' bag, with a very creative and fun shape... I love those in colourful madras checks! 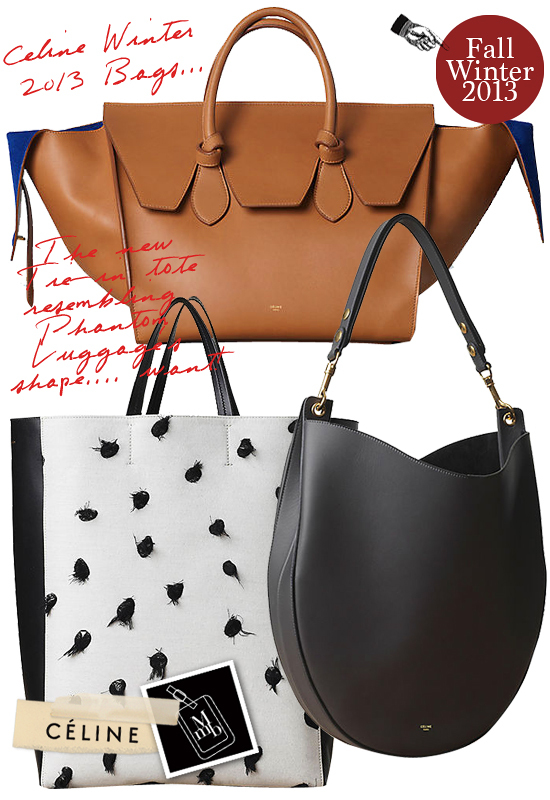 Click here for more pics of Céline Winter 2013 Bags Collection on my facebook fanpage. 'LIKE' my fanpage if you enjoy reading this post.